Showing search results for Being Strong Quotes, Quotations & Sayings 2019. Hardest times often lead to the greatest moments of life. To make you stand firm in life you have to know what the falling is like. being strong makes you firm & tough to with stand the storm of life & here struggle is the best tool to make you strong enough to take eventuality by horn. 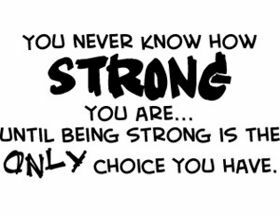 Being strong is not an option for those who want to survive, it is a necessity. My highest ambition is to crawl out from under the ash.. And laugh at all the things that thought they could bury me.